Politics and contemporary art have long been inextricably linked. However, in recent years, their relationship has moved to a whole new level. Let’s just remember a flurry of activity among artists, gallery curators, and publishers before and after the election of Donald Trump. Moreover, while some artists play by the rules, others are not afraid to step out of their safe zones, using art to highlight injustices, show social issues, and present new political ideas. This is especially true for street and urban art that carries various politic, social, and environmental messages in a very creative and captivating way. For today, there are many talented street artists installing their bold works across the urban environment. However, you will hardly find a more famous political artist than Banksy. The amazing stencil works by this elusive British artist are filled with social and political commentary on everything from poverty to global warming, which makes them a somewhat new form of contemporary art. It is also worth noting that Banksy murals, despite (or thanks to) their controversy, are extremely valuable today, with some pieces sold for millions of dollars. For example, one of the artist’s works, titled “Keep It Spotless,” went under the hammer for an impressive $1.87 million at Sotheby’s Charity Auction in New York in 2008. 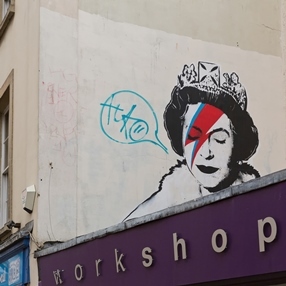 Besides, according to Steve Lazarides, the co-founder of the London-based gallery Lazinc, who is also credited with launching Banksy’s career, another work by the anonymous street artist was sold for a record £1.5 million (almost $2 million) several days ago. This private sale took place 24 hours before the Lazinc exhibition “Banksy, Greatest Hits: 2002 – 2008” officially opened its doors to the public on July 12. Politics and contemporary art are indeed strongly interlinked. Moreover, this unique relationship continues to grow, bringing truly original and meaningful artworks into our lives.